What?! 😀 Yes, it’s possible, and it’s really useful! I’m sure you already had that situation, when searching for something in menus, you knew where it was, but can’t find it! 😀 There is one awesome little feature (undocumented one) that allows you to display menus without separators and sorted alphabetically. 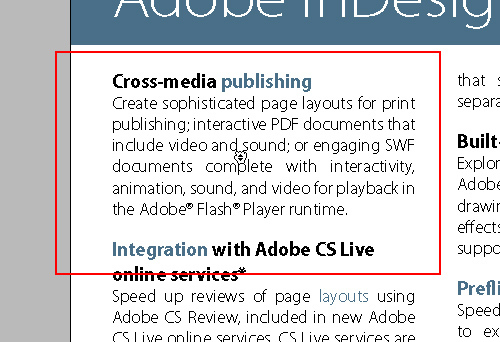 This feature is available for a long time, starting with InDesign CS. Custom shaped corners are available from very first versions of InDesign, but, they were never really improved them till CS5. Now, we can set different diameters and shapes, and for me personally, biggest improvement is ability to modify them Live, without need to go to dialog box! This is also, one of my favorite features! (I have so many favorite features! I don’t know why?! Or maybe I do! I just love InDesign! :D) There is fast and easy way to transform selected object and create duplicate. So, how to do it? It’s really easy. All you need is Alt (PC) / Opt (Mac)! There are so many places where you can utilize this useful feature! As you can see form screenshot, you can use it in Transform Panel/Control Tool Bar. Select object, input new value in X or Y field and hit Alt (PC) / Opt (Mac) + Enter. InDesign will automatically duplicate selected object and move duplicate by amount of units you entered! So easy! Guides are very helpful, and I use them all the time. But, when you need to create them, that can be really time-consuming. Fortunately, there is little helpful feature that will save you some time and energy while creating guides! InDesign allows you to draw both horizontal and vertical guides simultaneously! Have you ever placed bunch of images and after placing you selected all of them and applied same Object Style? If you even tried to select Object Style before placing, don’t bother anymore, it can’t be done. It’s a bug! But, fortunately Michael Ninness (VP of Content, lynda.com, former InDesign Product Manager, designer, author) mentioned a little “easter egg” in InDesign CS4 that (sort of) fixes the bug and it’s also working for CS5! Power + Zoom = Power Zoom! So, how to activate/use it?